Using off-the-shelf smartwatches, limited to Apple Watch and Android Wear devices, a team of researchers from the UCSF Health eHeart study and software engineers from Cardiogram created a deep learning algorithm it hopes will one accurately detect atrial fibrillation. To reach that goal, the project, designated mRhythm Study, needs data. Cardiogram cofounder Brandon Ballinger told AppleInsider that over the past few months the team developed a preliminary machine learning algorithm capable of detecting AF using consumer grade heart rate sensors. Ballinger, along with fellow cofounder Johnson Hsieh, are now working toward a more complex algorithm they believe will yield more accurate results. At mRhythm's core, the semi-supervised deep learning algorithm is capable of "learning" from users both with and without heart conditions. Ballinger said data will be aggregated from participants with advanced EKG monitors like those from AliveCor —the company announced an Apple Watch band called Kardia earlier today —as well as users with vanilla Apple Watch hardware. 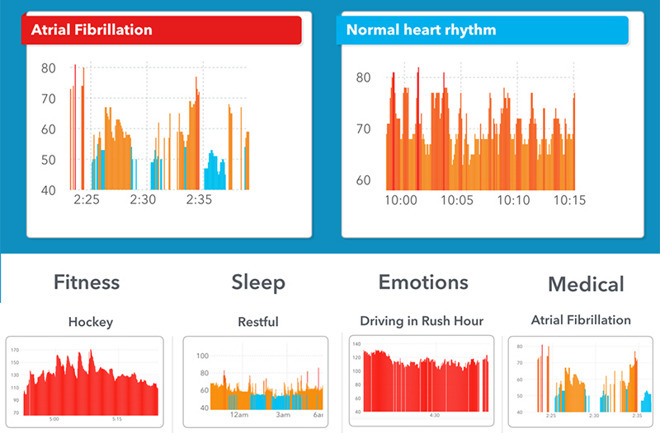 Like other recent medical studies leveraging Apple's hardware, mRhythm is integrated with the HealthKit framework. On iOS, for example, the app pulls and organizes data from the Health app to provide a top-down view of heart rate trends and granular analysis of the heart's reaction to outside stimulus. "This is the very first baby step to using the Apple Watch as a medical device that can affect people's lives," Ballinger said. "We've been incredibly impressed with the work Apple put in and the little details it got right." mRhythm officially kicked off on Wednesday and researchers expect to publish results in a peer-reviewed journal by year's end. Apple Watch owners interested in taking part in the study can download the Cardiogram app for free from the App Store and sign up online.